The spatial resolution of conventional optical microscopes is limited by diffraction to about half the wavelength (Abbe diffraction limit). neaspec broke the diffraction limit by developing the neaSNOM microscope, a groundbreaking apertureless near-field microscope (known as scattering-type Scanning Near-field Optical Microscopy, s-SNOM) that combines Atomic Force Microscopy with optical imaging and spectroscopy at the nanoscale. neaSNOM employs standard metal-coated AFM probing tips (T), illuminated by a focused laser beam (L). Illuminated tips generate a nano-focus (N) at their apex, used as an ultra-small light source to locally probe the sample. The size of the nano-focus is determined only by the radius of the tip apex. This is true even for electromagnetic waves much longer than the visible light, like infrared and terahertz radiation, yielding the same spatial resolution of 10 nm throughout the optical spectrum. Because of an optical near-field interaction between the tip and the sample, the elastically backscattered light (S) contains information about the local optical properties (e.g. chemical ID) of the sample. The signal strength is several orders of magnitude higher when compared to inelastic light-scattering techniques like TERS (tip-enhanced Raman spectroscopy). Therefore neaSNOM allows any kind of orgnic and inorganic sample to be analysed with 100% reproducible and high quality data. neaspec’s patented near-field detection technique eliminates the unwanted diffuse light and filters the only 1% small near-field signal out of the scattered light (S). Only this optical filtering technique allows 100% reproducible results at 10nm spatial resolution. Optical imaging is performed by detecting the backscattered light interferometrically (optical amplitude & phase are acquired simultaneously) while scanning the sample surface topography. 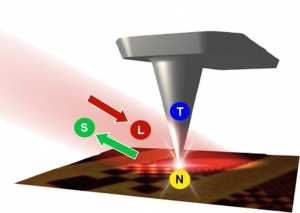 By illuminating the AFM-tip with a broadband infrared laser, an IR-spectrum of a 10nm spot is recorded (nano-FTIR). The neaSNOM microscope combined with imaging & spectroscopy systems from neaspec thus allow to study chemical, structural and electronic properties of a sample @ a spatial resolution up to 1000-times higher when compared to conventional technology like micro FT-IR. The non-destructive measurement method is equally suited for organic and inorganic samples and requires only standard AFM sample preparation.